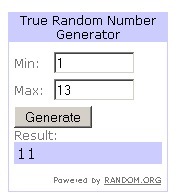 With the Ziploc Prize Pack Giveaway over, I checked Random.org and the winner was #11. Checking the comments, this was Cheryl F. (The Lucky Ladybug). I contacted her and she’s already replied with her address. Congratulations, Cheryl!